The heir to the British throne, Prince Charles has warned that the decline of Christians in the Middle East is a major blow to peace as they often act as bridge-builders between communities. 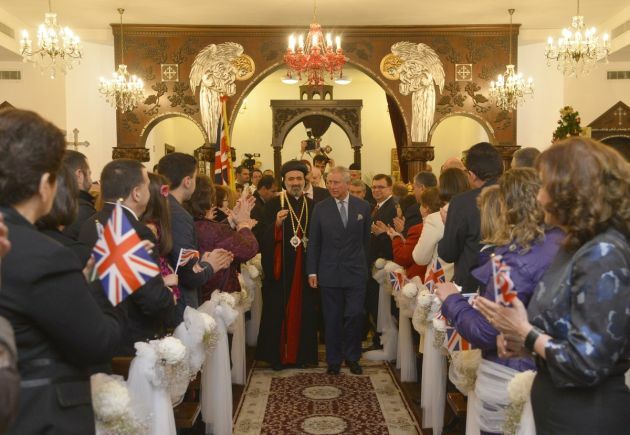 Charles, who is the Prince of Wales, at an inter-faith ceremony Tuesday marking the period of Advent was speaking to Christians from the Middle East. "It is important to note, above all, that the decline of Christians in the region represents a major blow to peace as Christians are part of the fabric of society, often acting as bridge-builders between other communities," said the prince who is a commited Christian. "It seems to me that we cannot ignore the fact that Christians in the Middle East are, increasingly, being deliberately targeted by fundamentalist Islamist militants," said Charles. In doing so he echoed the setiments of clerics from different faiths who have spoken out against sectarian violence in the region. He spoke in the presence of Prince Ghazi of Jordan and also at the ceremony were the Archbishop of Canterbury, Justin Welby, the Roman Catholic Archbishop of Westminster, Vincent Nichols and the Chief Rabbi in Britain, Ephraim Mirvis. "Now, of course, is the time to re-double our combined efforts to stress what binds the three Abrahamic faiths together and, as Christians, Jews and Muslims, to express outrage at what tears us asunder," said the British prince. "In saying all this about the difficulties facing the Christian churches in the Middle East I am, of course, conscious that they are not the only faith community in this region suffering at the moment," said Charles. He also said the Middle East is not only part of the world in which Christians are suffering. "But, given the particularly acute circumstances faced by the church communities in the Middle East to-day, I felt it worthwhile to draw attention to their current plight," said the prince. He explained that for 20 years, he had tried to build bridges between Islam and Christianity in order to fight ignorance and a lack of misunderstanding. "The point though, surely, is that we have now reached a crisis where the bridges are rapidly being deliberately destroyed by those with a vested interest in doing so – and this is achieved through intimidation, false accusation and organized persecution – including to Christian communities in the Middle East at the present time."